In 2016, the city’s top six attractions welcomed some 28 million visitors. The city has observed increasing growth in employment and output in its accommodation and restaurant sub-sector in the last 10 years, having recorded growth of 2.6%. 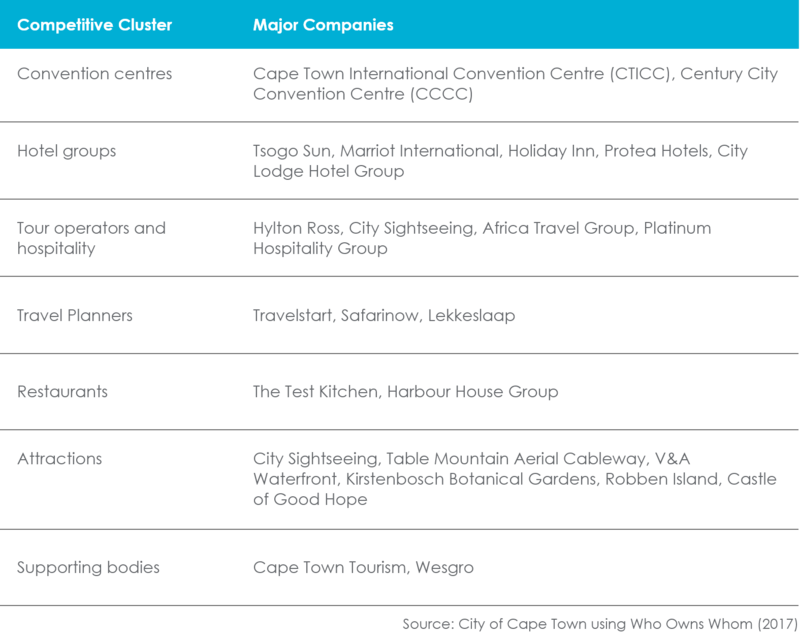 Major companies across a spectrum of clusters (including convention centres, hotels, tour operators and hospitality, travel planners, restaurants, attractions and supporting bodies) have a presence in Cape Town. Cape Town has a natural scenic appeal, in part owing to it having Table Mountain, one of the seven natural wonders of the world. The natural attractions of Cape Town contribute to the city being viewed as a destination where tourists do not have to spend a lot of money to have a good holiday. The city provides first world infrastructure and tourist facilities, including conference facilities. Cape Town has the country’s second largest airport, which makes the destination more accessible than others in Africa. Cape Town’s tourism brand has become self-sustaining, with the City regularly making it onto top ten lists globally. Some of the best restaurants in the world are located in Cape Town, helping to establish Cape Town as a major gastronomic destination on the continent. There is a strong perception that Cape Town is a safer travel destination than other cities in the country. The relatively weak exchange rate also works in the favour of international tourists.